On a related subject, let me comment on an interesting controversial art exhibit that shows off or applauds street art or aerosol art but fails to separate from the work of these artists the vandalism of graffiti. There’s a huge difference and the artists themselves know the difference. This is not a question of taste or liking one style of art better than another. Even if the lettering of graffiti is decorative, that doesn’t make it art any more than calligraphy is generally considered art. But defacing someone else’s property does make it vandalism. 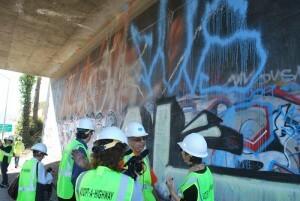 As an art conservator who works on murals, I deal with the damage caused by “graffiti vandals” who think they have rights or freedom of expression to vandalize, deface private and public property, ruin true works of art that have a legal right to exist and whose defacements represent and promote the dregs of society. The only justification that these outlaws have is the same mentality that justifies anarchy. HOWEVER, the show at MOCA shows off the art skills of street art that could be compared to the NBA compared to the regular “street art” and scribbled comments on walls you will see around town. Some of these artists are true geniuses and their art is amazing. There is a place for it and it beautifies and stimulates a community. 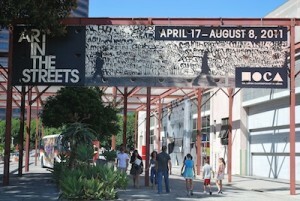 The MOCA show, while making a small obligatory mention of tagging being bad, there was not a “stand taken” and a line drawn between tagging and quality street art. There was no teaching. In the interest of misguided freedom of expression, they missed the boat on educating the public and did not express both sides of the difficult and insidious debate/problem. As much as I like street art or aerosol art in the right locations, I think its pretty obvious that graffiti tagging with monikers is vandalism. 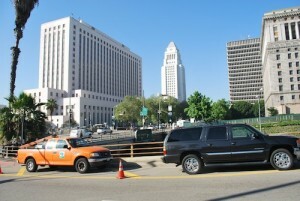 This entry was posted in Murals and tagged Caltrans, Graffiti, Mural Conservancy of Los Angeles, Mural conservation, mural restoration, Scott Haskins, Street Art. Bookmark the permalink. Thanks for sharing your nice experience with us. 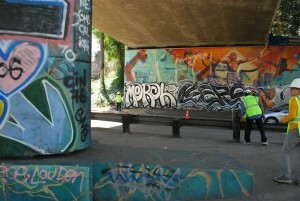 Really awesome article about the freeway murals. I’m always wondering what happens when they get tagged and painted out. I truly find this an interesting subject as I look at these murals everyday as I drive the LA freeways. Its been a really sad thing for me to see the really great murals tagged… then painted out. I never looked at this subject in this manner. Keep us all updated!